The HP version has a quote positioner whiche facilitates the setting of passes on the profile to bend directly inserting the bending radius. It comes complete with rolls and tools which are user friendly and allow the possibility to process many different tubes and profiles. 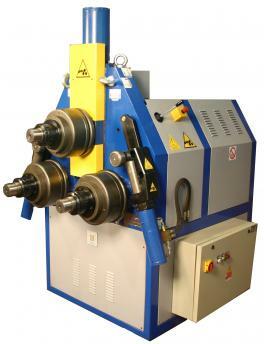 The CN version has a numerical control which enables it to perform variable bending radii without any difficulty. Allowing for the manufacture of round, Mediterranean, pointed or oval arches as well as many other shapes with a continuous join between straight and curved parts. The machine can work both in the vertical and horizontal positions. It comes ready to work complete with a set of rolls and tools, there are a wide range of accessories available.